We've had a few days of nice winter weather and for the those of us who have been able to get out and enjoy the views in the gorge and elsewhere I thank you for the TRs. I will contribute a few photos of winters past for your vicarious pleasures. And here is a real blast-from-the-past: The house I grew up in, in the Irvington area of Portland. I took this photo at the end of Dec., 1968 and after hearing that the snowstorm of 2008 was worse than that one, I drove by my old home to take the next photo. I remembered more snow that winter of '68 than any I had ever experienced. I was really into weather then and recorded an 8 degree low that morning and a 13 degree high. (Possibly the lowest ever in Portland in the 20th century) The east winds hit 80 mph in east county and about half that in the rest of town. As I remember it, a couple of duck hunters died of exposure on one of the islands in the Columbia that day and even the coast guard was unable to get to them in time. can't find the darn photo right now. will add later. 1968 at the I84 Fwy overpass just east of the bridge at Troutdale. Is that a snowdrift, or what!! I took one of my nephews on a hike up Eagle Creek that winter and here is what it looked like at High Bridge. We could not get past this point as the ice sloped towards the cliff edge and the ice formations were way too big to get our arms around and of course, the cable was simply way too covered in ice to get a purchase on. I think we had some anarchy just a few week ago, but that was for a different thing! ahhh.... politics leaking into the hiking forum? I remember shoveling huge drifts of snow blocking the door. And the backyard filling up with fir branches after the Columbus Day Storm. Oh wow! Thanks for the cool photos. Those Eagle Creek ice and snow shots are INSANE. 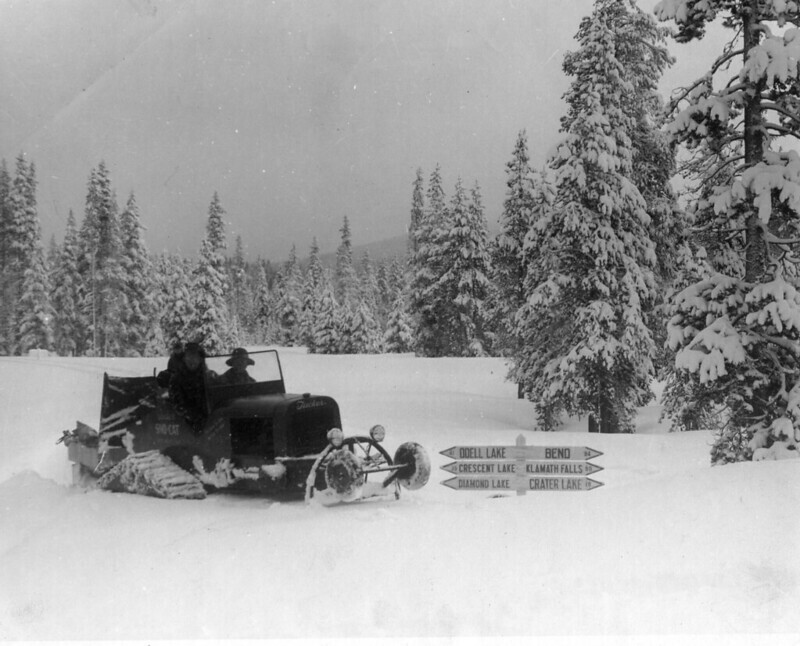 This is a fun winter photo I found in the Mt. Hood National Forest archives, although this location cannot be in that particular forest based on the mileages on that sign. Somewhere in the Umpqua NF, I'd guess. The date on the back said 1945. Thanks Don for the nifty photos. 2008 was quite a year for snow in the Gorge. of course I was there backcountry skiing. 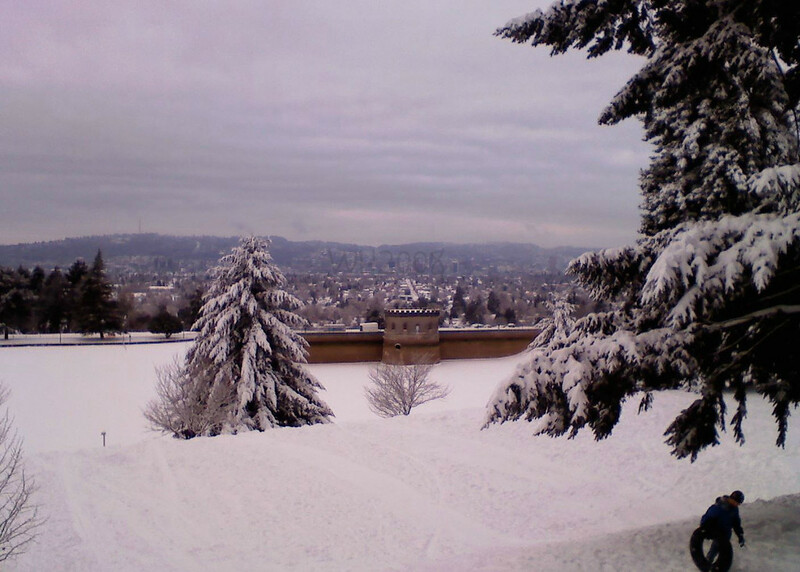 Probably the only time I will ever get to ski Mt Tabor. Thanks everyone for the nice comments and the photos! Great photos everyone. I really love the snow cat, been a few times I could have used that just to get out of my driveway. Oh wow, you have great photos there. Those pics reminded me about my childhood when me and my sister were chasing down under the passages full of snow.